So before you read this review of this book I have to be up front and say that I worked on this book… So… Of course its fantastic and you must buy it. But Seriously for the better part of last year I have been spending my spare time to be the Technical Editor for Jeremy Moskowitz latest book called “Group Policy Fundamentals, Security, and the Managed Desktop”. 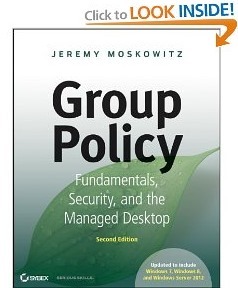 This book is hands down the best Group Policy book that you can buy. What I really like about this book as it covers everything from the basics of Group Policy and how it works to some of the most advanced topic, heck, even I learnt a few things. So if you are just staring out with group policy or if you just want a great reference with heaps of example (and screenshots) this this is definitely the book to buy. Even if you have had bought this book previously you will still find it very useful as it has been updated for Windows Server 2012 and of course all of the screenshots have been updated (mainly by me) to Windows 8. So… Buy it now keep it on your shelf as the ultimate reference… or just brush up with what is new in Windows Server 2012 what ever way this is one reference book that will not collect dust. Can we hope that the book will be translated, for instance, into Russian? What I really like about this book as it covers everything from the basics of Group Policy and how it works to some of the most advanced topic, heck, even I learnt a few things. All the ssc secondary school certificate examination candidates should download their SSC Result 2017 from the Official website of eboard results of all education board results Bangladesh. The14th ranked Stanford Cardinal and Rice Owls will travel Allianz Stadium in Sydney, Australia to kick off their College Football season this .. I am very glad to read the post,it is very well written.You have done hard work in writing this post and i impressed your work. Thanks a lot.